Pediatric researchers from the University of Miami analyzed the results of 25 clinical trials using probiotics during pregnancy and concluded that the children of pregnant women taking probiotics have a 12 percent risk reduction for allergy. These children have significantly reduced levels of IgE antibodies to common allergens, indicating that probiotics help train the baby’s immune system while in the womb. The field of epigenetics, meaning factors that influence how your genes express themselves, is the hottest area of scientific research in human health. It is now clear that both nutritional status and environmental influences have dramatic impact on epigenetic settings – many of which are established while in the womb and during early life. During pregnancy, a woman’s immune system is downregulated so that her own immune system does not reject the fetus. Women with a poor diet or a history of digestive issues are more at risk for bacterial and yeast populations taking advantage of this situation, although any woman could have issues they never had before. It is already known that imbalances in digestive flora are pro-inflammatory and contribute to allergy. 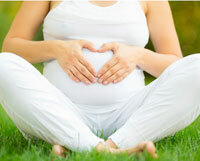 Taking friendly flora supplements during pregnancy helps keeps the digestive balance of power in a healthier condition. It is no small task to train the immune and digestive systems of a baby to function in an optimal way, even for health conscious parents. It is important to keep in mind that these lessons start early and a key time for epigenetic settings is while the baby is in the womb.